This popular book helps couples and singles discover ways to balance space, caring and connection. Are you tired of hurt feelings and misunderstandings that lead to anger and resentment? Is resentment eating away at your relationship and interfering with the good stuff? Would you like more connection and intimacy? Relationships are a balancing act - between your yearning for closeness and your need for distance. Breathing Room brings new perspective to the idea of space in relationships. You'll discover which space struggles are really about cultural, generational and gender style differences. You’ll learn about different expectations, disappointments, and hidden agendas. Different needs for space complicate our work and personal relationships every day. "No two people have the same need for togetherness or the same style of relating. 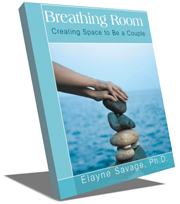 Breathing Room explores these differences and offers excellent solutions for couples AND individuals - I recommend the book and Dr. Savage’s seminars to anyone who wants to be in a successful relationship." – Elizabeth Wagele, author of The Enneagram Made Easy and Are You My Type, Am I Yours? "In Breathing Room, Elayne Savage reminds us that intimacy requires both closeness and space. This book is a refreshing read for couples who seek to deepen their bond." ? – Susan Page, author of Why Talking is Not Enough and If I’m So Wonderful, Why Am I Still Single?